While traditional petro-convenience brands still sell the most gasoline, consumers are increasingly opting to fuel-up at their favorite grocer or warehouse retailer. Costco and Kroger are consumers’ favorite places to fill their gas tanks, according to a new consumer study by Market Force Information, the world’s leading customer intelligence solutions company. The panel research study was conducted in April with more than 4,500 participants across North America. The study showed warehouse retailers and grocers are closing in on traditional gas stations in a bid for consumers’ wallet share. While 56% indicated they visit national gas station brands to fill up, approximately one-third (32%) frequent mass retailers and grocery stores. See Graph 1. In industries like petro-convenience, location and availability have a large influence on purchasing. But, Market Force also wanted to understand underlying consumer preferences, so consumers were also asked to name their favorite petro-convenience retailer—the one they like the most out of all they patronize. 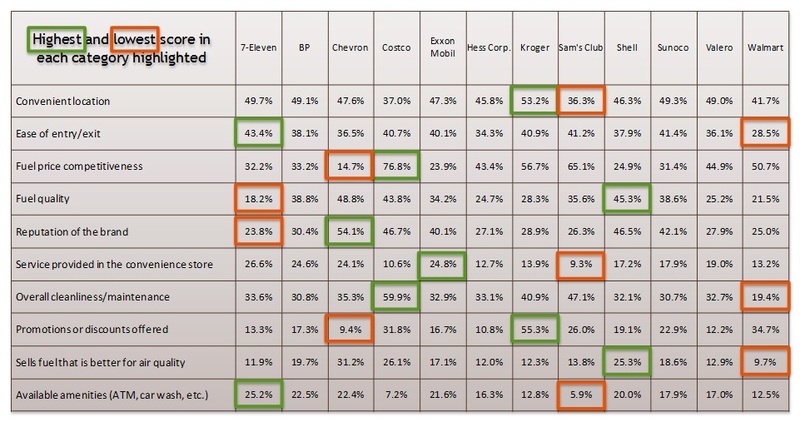 Three brands were clear favorites: Shell, Costco and Kroger. Because some retailers have thousands of locations and others have a fraction of that, Market Force indexed the results by location count in order to even the playing field. When the results were indexed, Costco emerged as the No. 1 choice with an index score of 371. It was followed by Kroger at 322, and Sam’s Club at 284. 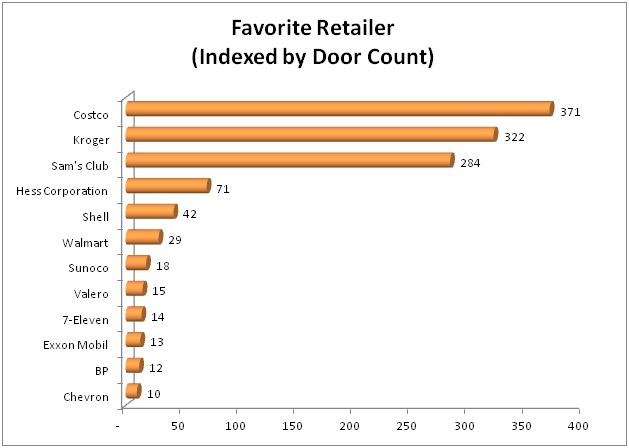 Graph 2 shows a ranking of the stores that garnered at least 3% of the consumer vote. Market Force dug in deeper to understand why consumers prefer their favorite gas station/convenience store and the attributes that matter most to them. 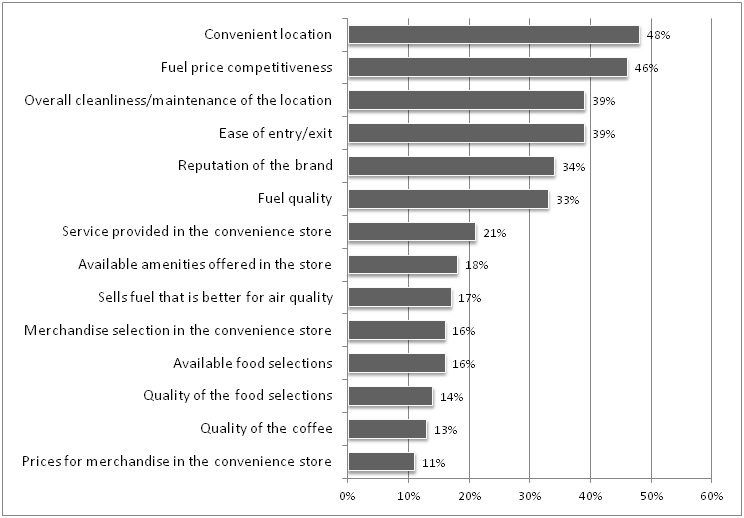 Not surprisingly, convenience (48%) and price (46%) were the top drivers for choosing a petro-convenience retailer. But cleanliness matters a great deal to consumers, with 4 in 10 ranking that as an important differentiator, followed by ease of entry onto the property, brand reputation, fuel quality and customer service. Attributes like food and coffee quality and merchandise prices ranked lower on the list with 10 – 15% of consumers saying those were important to them. But Market Force points out that typically more than half of consumers are ‘gas and go’ customers that don’t buy from the convenience store, so food and coffee quality are important draws to the subset of consumers who frequent the convenience store. See Graph 3. How did brands do on those important attributes? Out of the retailers studied, Costco, scored highest for overall cleanliness and fuel price competitiveness, while Kroger scored highest for convenient locations and promotions. Costco also received the highest number of votes for the statement, “I would drive past a competitor’s location to fuel at this location,” which suggests consumers view the retailer as a gas price leader. Meanwhile, Shell ranked first for the quality and environmental friendliness of its fuel, and 7-Eleven earned top marks for its available amenities and merchandise selection. See Graph 4. In order to better understand the loyalty drivers for gas/convenience stores, consumers were asked to name the places where they had fueled up in the past three months. The responses were extremely wide-ranging, from national retailers such as Shell, BP and 7-Eleven, to smaller regional brands such as RaceTrac and Marathon Oil. The extreme differentiation seems to point to a lack of loyalty in the petro-convenience industry. Respondents were further asked if they would drive past a competitor’s location to fuel at their favorite station. Forty-five percent indicated this statement is “very true” of their favorite retailer. However, when asked if they would always choose their favorite brand over other competitive brands even if the price is higher, only 17% said that was a “very true” statement. Market Force’s study revealed approximately 36% of customers have a loyalty card for a petro-convenience retailer, which rewards consumers for frequent purchases. Grocers dominate the loyalty card category, with Kroger, Safeway and Sam’s Club the most popular choices among those surveyed. See Graph 5. Fifteen percent of consumers have a branded credit card associated with a petro-convenience brand. Among those who carry these branded credit cards, Army & Air Force Exchange Service led the way with 38%, followed by Sam’s Club (27%), Murphy Oil (22%), Chevron (21%), Walmart (19%) and Shell (16%). The survey was conducted in April 2012 across the United States and Canada. The pool of 4,500 respondents reflected a broad spectrum of income levels, with approximately 70% reporting household incomes of more than $50,000 a year. Respondents’ ages ranged from 19 to more than 65. Approximately three-quarters of respondents were women – the primary household consumer purchasers – and 75% reported working full or part time. Half of the respondents have children at home and more than two-thirds are married. Market Force is the leading global customer intelligence solutions company for multi-location businesses, including major retailers, restaurants, grocery and convenience stores, financial institutions, entertainment studios and consumer packaged goods companies. With more than 125 years of combined industry experience, Market Force Information has pioneered the industry with a suite of customer intelligence solutions – from 600,000 field associates across North America and Europe who conduct mystery shopping, merchandising and retail auditing, to real customer surveys and proprietary decision-support tools. Its solutions provide a holistic view of the customer's on-site experience and identify the actions required at the store level to increase customer loyalty and improve financial performance. Market Force was named one of Forbes’ America’s Most Promising Companies in 2011. For more information, visit http://www.marketforce.com.